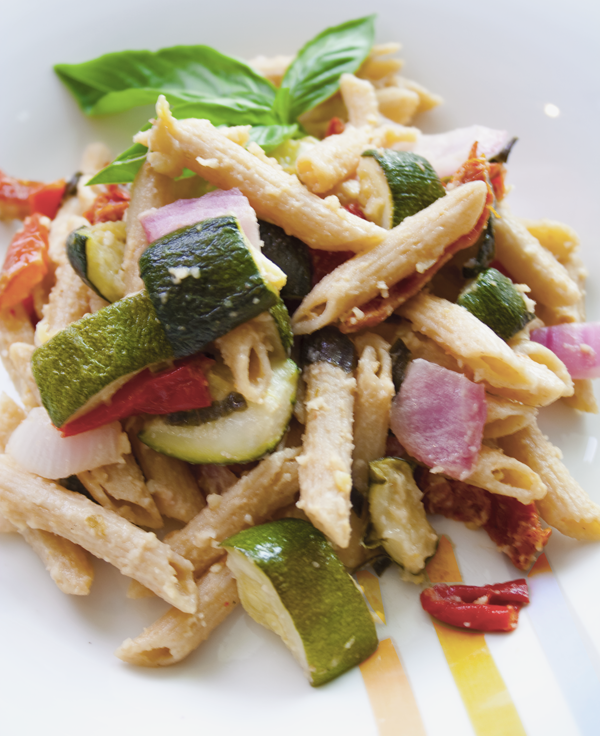 A tangy Italian vegan pasta recipe. Perfect for whole wheat pasta. Want to know what others thought about this recipe? Would you like to comment on this recipe? Go to the Tangy Italian Pasta blog entry. 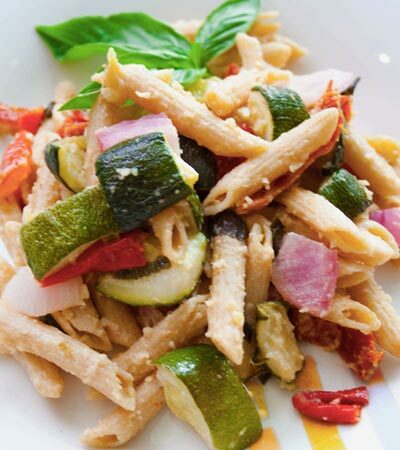 Chop the red pepper, purple onion and zucchini into 1 inch chunks and if you are going to use fresh tomatoes instead of dried tomatoes, chop the cherry or pear tomatoes in halves. Place red pepper, zucchini and tomatoes (if using fresh) onto a cookie sheet sprayed with a little olive oil. Set aside the purple onion for the last few minutes of cooking. We only want to wilt the onion, not cook it to death. Place into preheated oven and roast for 20 minutes, take them out and stir them around with a spatula. Cook 20 more minutes or until tender and slightly browned. Don't forget to place the onion in with the rest of the vegetables the last 5 minutes of cooking. While vegetables are broiling, cook the pasta. Follow the instructions on the box. Now prepare the slivered almond garnish by placing almonds into food processor and process until almonds become powder. After all ingredients are prepared toss cooked vegetables and pasta into serving dish along with red wine vinegar, olive oil, salt, sugar, onion powder, garlic, black pepper and fresh basil, processed almonds and stir together.